Doctor Who Season 11 Official Teaser: This is Gonna Be Fun! Jodie Whittaker's voice is perfectly Who. 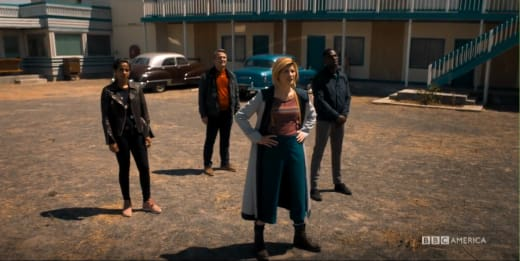 In this first look at the latest Doctor Who incarnation in action, she's picking out her new team and asking them very, very nicely. Will you be my new best friends? At the Doctor Who panel at Comic-Con International: San Diego today, BBC AMERICA revealed the first teaser footage for the brand new season, featuring Jodie Whittaker along with co-stars Bradley Walsh, Mandip Gill and Tosin Cole. Offering a taste of what’s in store for viewers this fall, the trailer sees the Doctor and her new friends, Ryan Sinclair (Cole), Yasmin Khan (Gill) and Graham O’Brien (Walsh), traveling through space and time. What we know for sure is this isn't the Who we know. It is, but it isn't. Doctor Who has been through a lot in this neverending lifetime, but switching sexes will completely different. Maybe she can give Missy a call to see what it was like going from the Master to Missy. Perhaps they can spark a completely different type of fenemy relationship with their sudden shared interest in hairstyles, makeup, and adventures of the female variety. 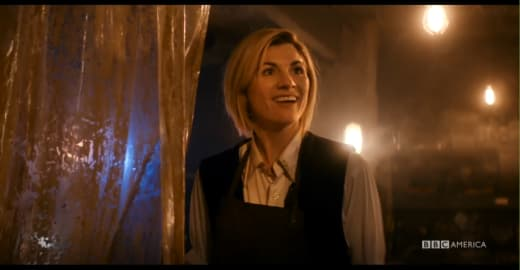 Yes, I fully expect Doctor to be the best woman she can be just like I expected him in his male bodies to be the best man he could be. Why not? There is a lot this soul can learn about life that as a man wasn't available. Being a woman will be a brilliant learning experience Who has been denied for many generations! There is so much to discover, in fact, that Doctor Who isn't taking along only one or two companions for this go-around, but three! And she's calling them her "best friends." There has been no doubt that's exactly what companions have always become, so why not calling them by their rightful term? What do you think about this first look at the new Who? Are you ready for the beginning of a new era? To revisit the manly side of things, watch Doctor Who online. In the meantime. Hit the comments and share this exciting news! Only in darkness are we revealed. [...] Goodness is not goodness that seeks advantage. Good is good in the final hour, in the deepest pit, without hope, without witness, without reward. Virtue is only virtue in extremis. This is what *he* believes, and this is the reason above all I love him, my husband. My madman in a box. My Doctor. The difference is this. Pain is a gift. Without the capacity for pain, we can't feel the hurt we inflict.